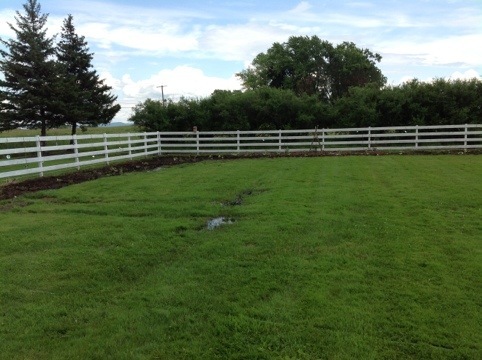 A unique and wonderful project has unfolded in Jessecology-land this summer. A client found me who has nothing but space- seriously, his family is situated on a 100 acre horse and cow farm- and he wants to grow his family’s own produce, but needs help as he has never done it before. Since we don’t lack for space, or finished manure compost, we decided to design as complete of a Companion planted bed as could be imagined. We generously planted Nasturtium, Marigold and Borage- as well as many other spicy herbs in and through the whole area to ward off bad bugs and invite the good bugs in. Geranium is planted at the corners as a perimeter trap crop, as is Catnip. Today we applied our homemade Compost tea, for the same effect as well as organic fertilization. 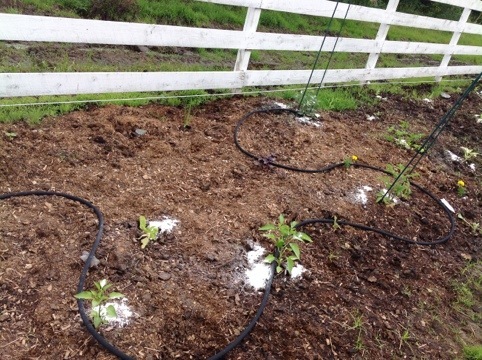 Just to get the jump on any potential lurking beetles, worms or catterpillars we also spread plain kitchen flour around the bases of all the vegetable and herb plants. We adhered to companion planting suggestions as carefully as we knew how, relying on Rodale.com for information that was new to us. A few standards are that Tomatoes and Basil should always be grown together- not only do they increase each other’s flavor but Tomato Hornworms hate the smell of Basil and they stay away. Peppers are also good nearby the Tomatoes. 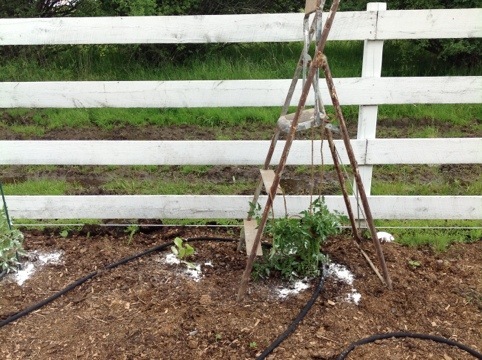 Peas improve the soil of everything they are near; Cucumbers especially benefit from Peas. On an old farm, with a barn full of fun surprises, staking materials are sure to be imaginative. There’s no end to the good reasons to have an edible garden on a farm. 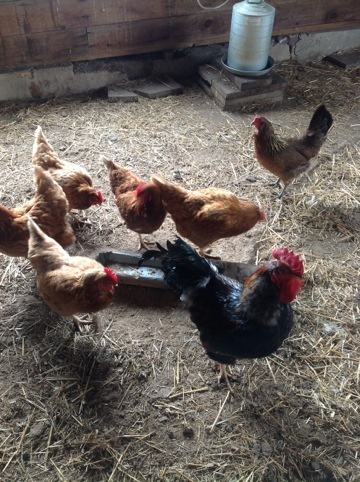 This bossy Rooster and all the hens can be set loose in the fall to eat bad bug’s eggs and weed seeds. We hope to have a large enough return from the garden to have a Farm Stand all summer. Look for us!